I weighed everything we received from Cooper’s Farm for this season’s community-supported agriculture program so that I could compare it with Plan B Organic Farms. The numbers always surprise me when I tally things up at the end. Did we really go through that many potatoes? Wow, we actually got more onions than cabbage. Sure didn’t feel that way. Getting vegetables bi-weekly instead of weekly definitely helped stave off the “oh no I’m swimming in vegetables” feeling. Some food was still wasted, though. Some of the beets got mold before we could do stuff with them (they came moist) and the rutabaga and turnips stumped us. But we managed to plow through most of the vegetables. We averaged 5.5kg per delivery, which was less than what we received with Plan B Organic Farms (see my fall analysis). That was a fall share, though, so winter/spring is understandably smaller in terms of the harvest. I opted for Cooper’s Farm because I thought the delivery might come in really handy during winter, but this winter was unusually mild, so I didn’t end up with as many “thank goodness I don’t have to trudge out for vegetables in the snow” moments as I thought I might have. That’s okay. This season, we’re going to skip the CSA and buy our vegetables ourselves. I want to see what that comes out to in terms of cost and whether we still get through as many vegetables without the forced commitment of a vegetable box. We’ll see! After a good summer season with Plan B Organic Farms, we decided to sign up for their fall season as well. This time, I made sure to weigh and track all the produce that came in. I also took notes on what we did with the produce to make it easier to think of ways to use them before they were wasted. What was the cost per kilo or pound? How does it compare to organic produce prices at the supermarket? What were the proportions like? Did they match up with our perceptions? How do I feel about the different vegetables now? How much did we get? Over the 11 distributions I tracked, we received a total of 71.6 kilograms of organic produce and a container of apple cider. 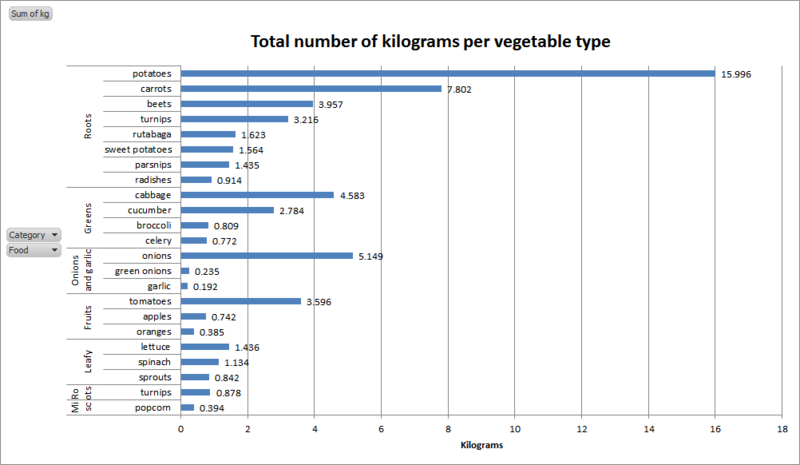 This worked out to an average of 6.5kg per distribution, with a standard deviation of 1.08kg. What was the cost per kilo or pound? Weekly half-shares cost $25, about $3.84/kg or $1.75/lb of organic produce (not including the cider). 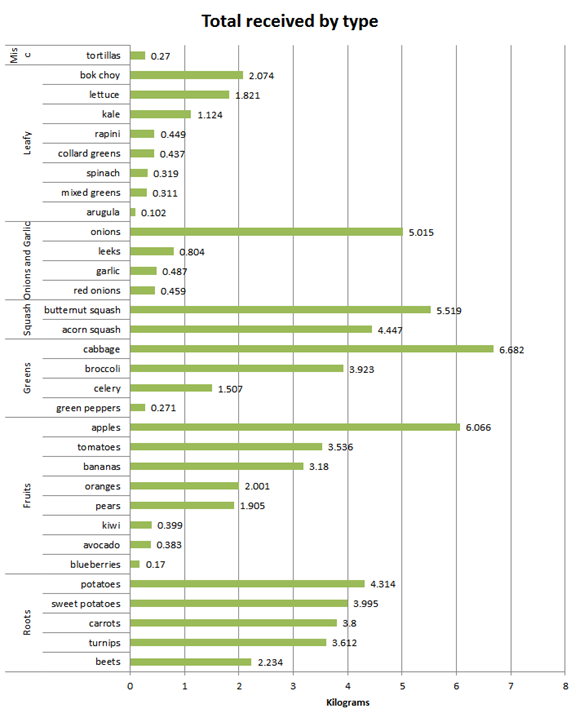 How does it compare to organic produce prices at the supermarket? The No Frills supermarket we usually shop at doesn’t have a wide selection of organic produce, so I used prices from GroceryGateway instead. In a past analysis, I found them to be usually 10% more than No Frills prices, and there are minimum order limits and delivery fees as well. Using the prices for organic produce whenever available and guessing “bunch” weights from my data, I calculated that we received an average of $31 of produce each week (including the cider). This worked out to a savings of $6 per week, or 20% (not including taxes, delivery charges, or other purchases to meet the minimum). Would we have bought all that produce if we weren’t part of the community-supported agriculture program? I’m not sure, but the commitment device of having a box of vegetables come into our house every week helped us improve our diet. I’m surprised by this, because it felt like we received a whole lot more squash and cabbage (which I’ve included in the Greens category). They were bulky and not in our usual cooking repertoire, so they were more of a challenge. We mostly managed to finishing the cabbage, but we had to cut up and throw some of the squash away. The apples and tomatoes were occasionally suspect, too. On average, we received 11 different types in a distribution (standard deviation = 1.2), covering 32 different types in total. The fall box included imported items such as bananas and kiwi to fill out the selection, as well as produce grown in greenhouses. How do I feel about the different vegetables now? After two seasons of community-supported agriculture, I’m more comfortable with dealing with the increased volume of vegetables passing through our kitchen. We’ve organized the pantries with bins so that we can store all the squash and onions neatly, and we manage to get through the produce in our fridge drawers in a reasonable period of time. We waste a small fraction of the produce through inattention (apples, mostly), but have managed to convert most of the produce into good food. I’d say we’re working at 90-95% efficiency or so. Some experimental recipes have been more fun than others. Sweet potato fries have become a favourite in the house. Baked acorn squash with brown sugar and butter is a nice winter dessert. We discovered that adding sausages to butternut squash soup makes it much easier to finish. Turnips and beets still need a lot of tweaking. We’ve signed up for a bi-weekly winter share from Cooper’s Farm CSA in order to take advantage of delivery. We happened to start with their program in time to make a side-by-side comparison with Plan B Organic Farms, and they turned out favourably (although their produce required more scrubbing). We’ll see how things work out over the next season. How I tracked this: I built a small tool for tracking community-supported agriculture into my Quantified Awesome website. Every week, I weighed all the produce and typed in the their names and weights. At the end of the season, I copied the data and used pivot tables in Microsoft Excel to analyze the results by category and week. I manually checked the GroceryGateway website for prices, and I used VLOOKUP to cross-reference the data with the prices. My input system didn’t do anything special that a spreadsheet couldn’t handle, although I liked how the weights became part of my dashboard. If you want to start tracking either community-supported agriculture or your regular groceries, you can start with a spreadsheet (Microsoft Excel or OpenOffice). Log the produce you receive or buy, and summarize them in ways that help you answer your questions. Have fun! W- and I are big fans of batch cooking. Making large batches of food and freezing individual portions means that our weeks go smoothly. There are no last-minute scrambles to cook dinner. We hardly ever buy lunch at work. Sometimes it’s like winning a very small lottery – will this lunch container be the one with the extra stuffing in it? Mmm. It takes just a little more time to make a double or triple recipe, and it usually comes to about as much cleaning up. The community-supported agriculture program adds a bit of a wrinkle. Getting fresh vegetables every week means we cook at least once a week instead of every other week or so. The variety of produce means we try new recipes as a way to use up the produce: potatoes, zucchini, and eggplants might go into curry, green beans get turned into pakbet or sauteed vegetables. 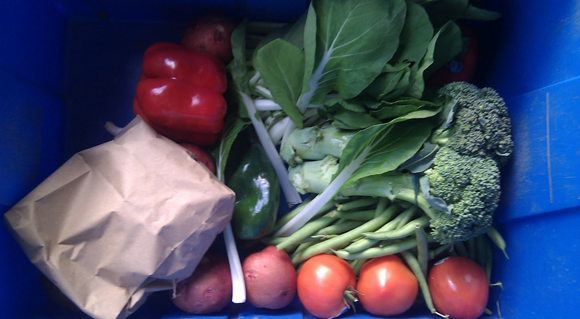 Even though it means we don’t get the full convenience of once-a-month-cooking (or however infrequently we can manage), the CSA program has been fantastic – more vegetables than we’d normally eat, and all local and organic too. Cool weather and a slow start meant our garden wasn’t as productive as it was last year. The tomatoes have barely even started, and the bitter melons aren’t going to produce anything at all. We did get a few wonderfully sweet handfuls of blueberries and strawberries, so that’s something. Still, with tides of vegetables coming in every Thursday, I haven’t felt much like cultivating lettuce or even harvesting our basil. The CSA we’re with (Plan B Organic Farms) offers a fall share from Oct 18 to Dec 31. It looks like a great haul, so I think we’ll sign up for that. When gardening season starts up again, I’ll sketch a new plan for the garden to take into account the kinds of things we get from the CSA. No onions, garlic, lettuce or zucchini, but yes to herbs and bitter melon, maybe okra. Yes to peas, which were ever so yummy. Maybe I’ll try farmers’ markets too. I do like the convenience (and the commitment device!) of having all the vegetables picked out, even if it forces me to get creative with all the zucchini. It might be good to try out other CSA programs, too. Cooper’s CSA comes out a little cheaper and gets delivered to the house. That’s going to be much appreciated in winter. Do you use a community-supported agriculture program? What do you think about it?